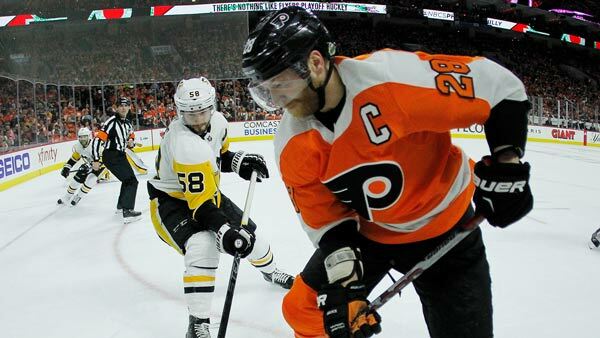 PHILADELPHIA -- The Philadelphia Flyers lost all three of their first-round playoff games at home to the Pittsburgh Penguins, losing the series in six games. On Wednesday, captain Claude Giroux said the team may have tried too hard at home, pressing, in part, because of the boos coming from the Flyers fans. "I think when it's not going very well, fans, they can get a little ... start booing us and stuff. That's when we try to do too much," Giroux told reporters, according to the Philadelphia Inquirer. "On the road, we don't really get that. We have our game plan at the start of the game, and we carry on for 60 minutes. "I think sometimes -- I'm not saying every game -- but some games, at home, it wasn't going our way. And sometimes it can happen like that. You can have a bad start. You can be down, 1- or 2-0. You [ideally would] keep going the same way you planned on playing the game. That wasn't the case. We kind of changed our game. We tried to do a little too much. Trying to do somebody else's job instead of going out there and playing the game." Philadelphia was outscored 18-6 at home and went 0-for-13 on the power play. Center Sean Couturier told the Inquirer that while the reaction from the fans can be frustrating at times, he doesn't think it contributed to the team's struggles at home against the Penguins. "There's some nights they probably had the right to boo us. We were bad enough and we probably deserved it," Couturier said. "... I don't really think it had an effect on the results of our home record. I think we're a tight group and we kind of shut it off."